Reconnect with the earth, reconnect with your true essence. We want you to experience the magic of our land, and the energy of Tulum. To do this, we encourage all our guests to get outside, to walk barefoot on the soft, white sand, to paddle or swim in the ocean, and to join in as much as you like with our varied group activities. We offer many options of classes and activities, both outdoors connecting with nature, and within our pivotal group studio, positioned directly on the beachfront, looking out over the turquoise Caribbean Sea. If you stay with us for a few days you can also buy a Yoga Pass for 5 classes for the price of 4 delivered by some of Tulum's finest certified instructors. FULL MOON FLOW - Every month on the full moon day, a class of yoga, sacred rituals and live music. Overlooking the rising moon. NEW MOON NOURISHMENT - Welcoming new cycles, resetting and cleansing intentions through movement meditation. SOUND HEALING - Alessandra Montana - Every Friday at 7.15pm - additional Sound Healing sessions will be available. 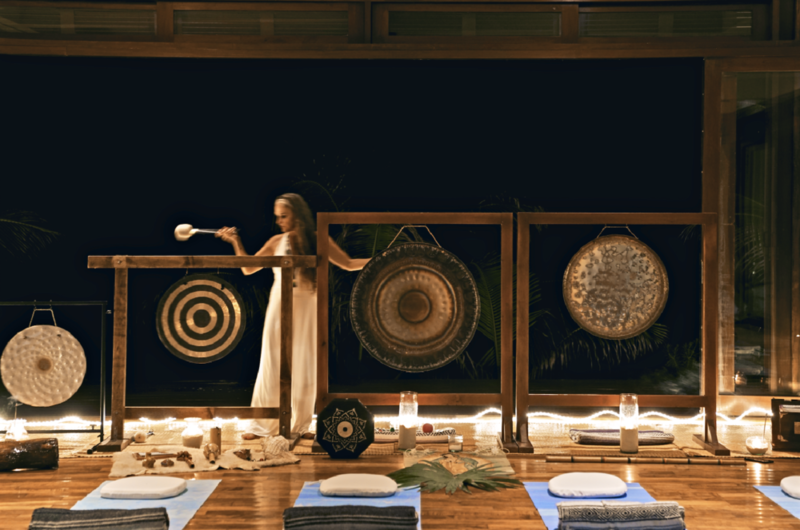 GONG BATH - Alessandra & Friends - Every Saturday at 7.15pm - Private sessions will be available throughout the year. SPECIAL CLASSES & WORKSHOPS - Throughout the year we host classes and workshops from world-renowned experts in health, healing, yoga and more. BODY AWARENESS - Karen Palafox - A conscious healing practice to work on alignment based on body self perceptions. MERMAID EXPERIENCE - Blend in the crystal clear water and become a real Mermaid. A unique swimming experience that will connect you with nature in the peaceful and mystical Mexican cenotes. SUP YOGA - Join us to flow and float and take your Yoga practice to a whole new level. YOGA OF THE VOICE - Chanting with Mariam. PERSONAL FITNESS - A ‘tailored to you’ workout on the beach with our resident fitness coach. Meditation - Improve breathing techniques to calm the mind and increase your vibration. Group or individual private sessions under request. A vibrational journey into the power of sounds and vibrations created by ancient instruments like Gongs, Crystal Sining Bowls & Pyramids, Tibetans Bowls,Shells and other vibrational instruments, you will be guided into a deep state of mental , emotional and physical relaxation. Dissolving patterns of stress, worry and anxiety and taking you into a place of acceptance, balance and peace. A journey into the magical field of the Gongs, opening up chakras and releasing of blocked energies. A session for fatigue, stress, anxiety , anger, fear and many other conditions caused by a lack of balance and harmony in the body and mind. It requieres nothing but receptivity. An experience that will create an ocean of sound profoundly relaxing during which all the worries and stress will be released in the Infinity of the Universe . Art with Me: What IF We Talk? Accommodating up to 40 guests for yoga and similar activities (and more for conference style set ups), Sanará's studio space forms the key communal gathering point for learning, exercise and growth. Sanará has leading yoga teachers living in Tulum as its resident class instructors and in addition is developing a roster of featured guest teachers from around the world. Our daily yoga and meditation classes, both in the studio and on the beach are available to outside guests also (unless otherwise specified). We also provides paddleboard yoga and SUP training certificates on the adjacent Mangrove cenote.